Heat preserves until completely melted. Add cilantro and whisk to combine. Heat 3 inches of oil in a heavy pot to 375 de-grees. Add wings in small batches of six. Fry them until golden brown and fully cooked, about 5 minutes. Remove and drain on paper towels, and keep warm in a 250 degree preheated oven. Repeat with the rest of the batches. 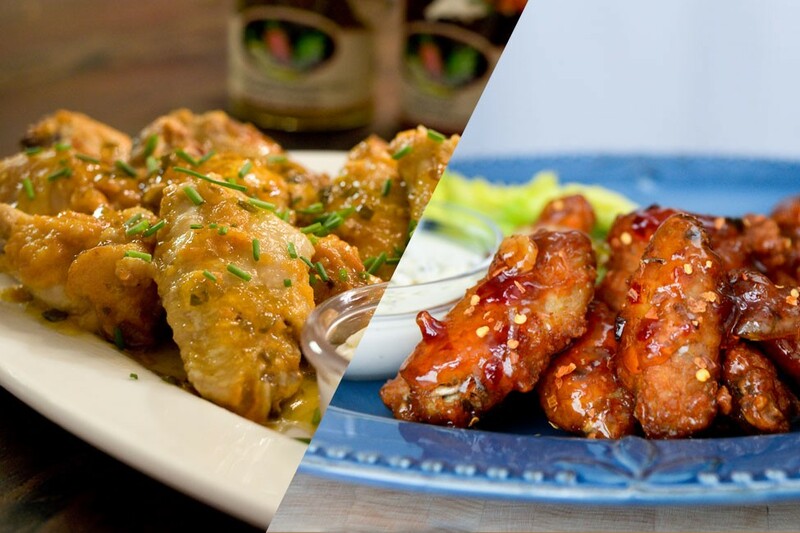 In the mean-time, prepare the two tossing sauces for the wings. Take the wings out of the oven and adjust the temperature to 325 degrees. Divide the wings in half and place into oven proof bowls. Pour the sauces into each bowl and toss the wings until well coated. Bake for 15 minutes to allow the sauce to seal to the wings. Serve with your favorite ranch or blue cheese dip and celery sticks.